Since it has been so long since I’ve posted I thought I’d give you two recipes for the price of one. Bargain! 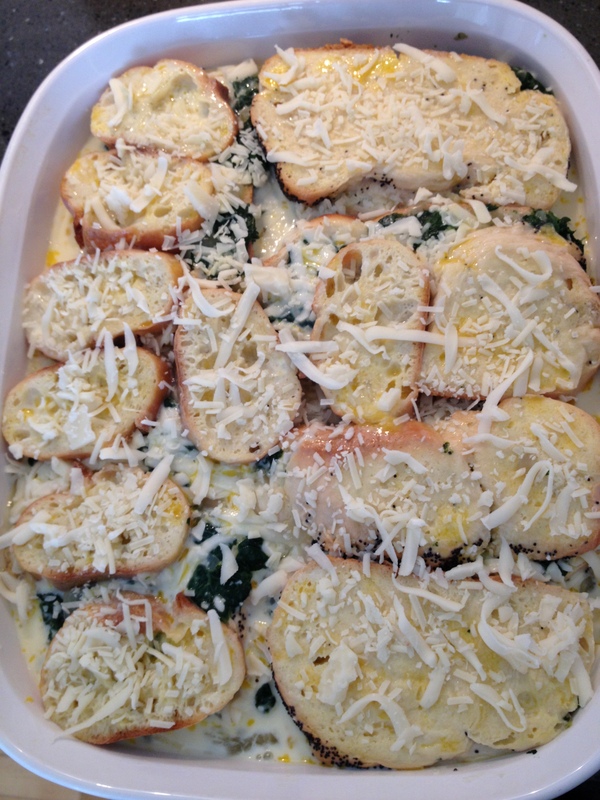 Amongst other tasty delights for Easter brunch I made a spinach and fontina cheese strata. 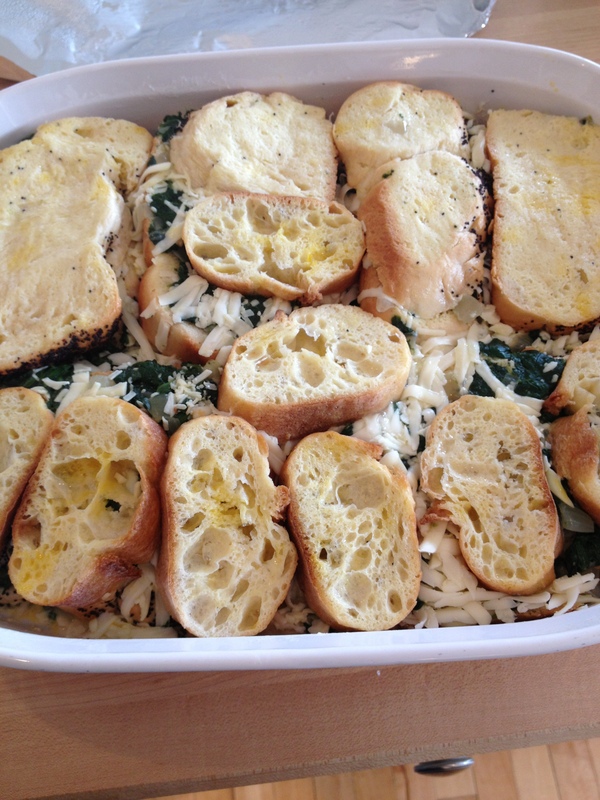 I’d never made a strata before but it was so easy I’m not sure why it took me so long. A strata is a cross between a bread pudding and a lasagna, in other words, cheesy carb-y deliciousness. Then, like you would do with a lasagna, you start to layer everything up. Then you mix up some milk and eggs and pour them over the whole shebang. One of the things that is great about this dish is that the milk and egg mixture needs to soak into the bread for at least eight hours which means you can assemble it the night before you serve it thereby making it a breeze the next morning when you want to serve it. You just add a little more milk and egg mixture and bake in a 350 degree oven for 45 minutes. Unfortunately I did not have a photo of the strata after it baked but I can assure you it was golden and bubbly and lovely and well-enjoyed by all. This is even simpler than the strata. 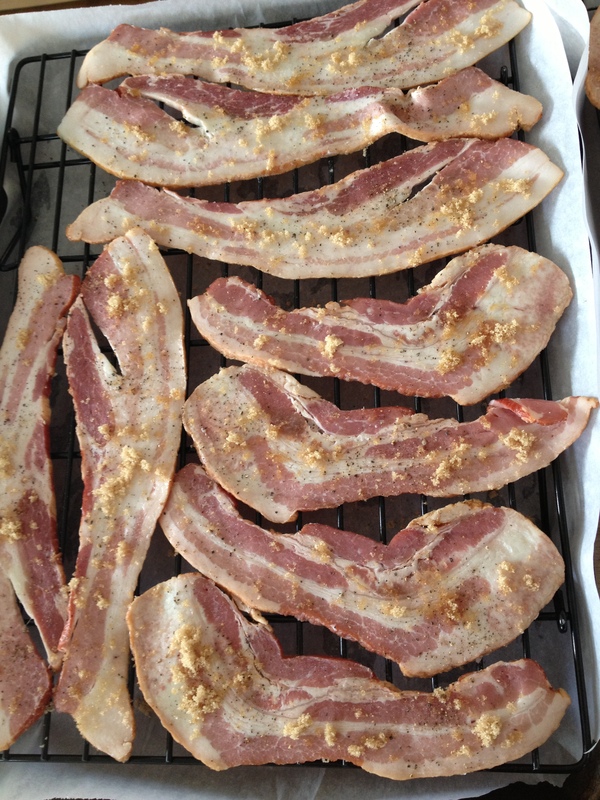 You lay bacon strips over cooling racks placed in parchment-lined baking sheets and then sprinkle with brown sugar and freshly cracked black pepper and bake in a 350 degree oven for 30 minutes until crispy. Voila! It was the first dish we ran out of at brunch! Heat oil in a large saute pan over medium heat until shimmering. Add onion and 1/2 teaspoon salt, and saute until translucent, about 3 minutes. Fill pan with as much spinach as will fit; cook, stirring, adding remainder a handful at a time as space allows. When all the spinach is wilted, stir in pepper and nutmeg. Drain spinach in a sieve. When cool enough to handle, squeeze excess moisture from spinach by hand. Butter a 3-quart baking dish. Place a third of the bread in a single layer in dish. 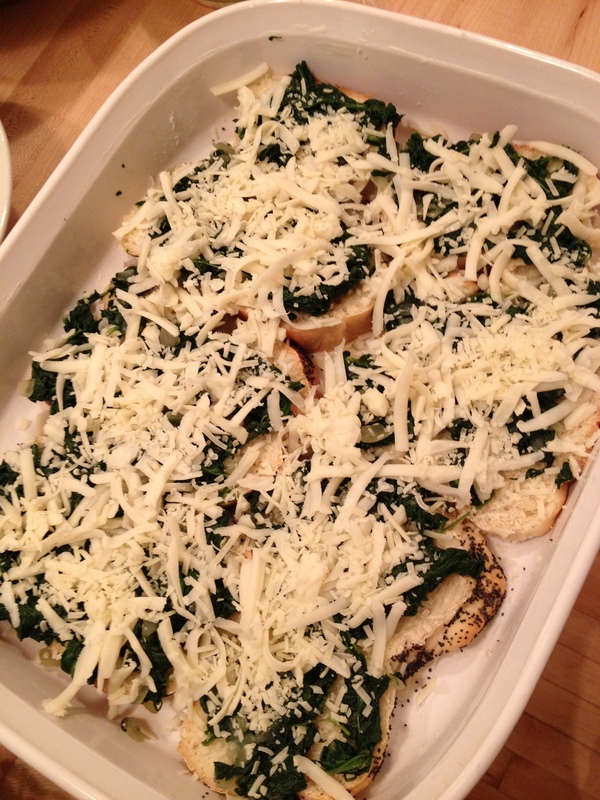 Top with half the spinach mixture and a third of the cheeses. 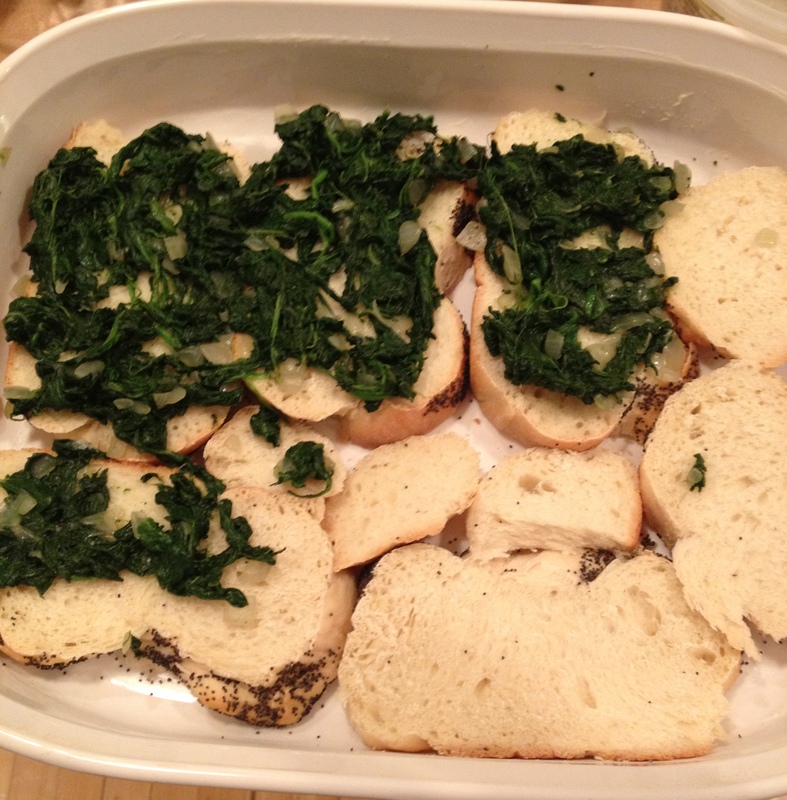 Repeat layering with a third of the bread, remaining spinach mixture, and a third of the cheeses, then top with remaining bread. Preheat oven to 350 degrees. Line two 10-by-15-inch rimmed baking sheets with parchment paper; place a wire rack on top of each sheet. 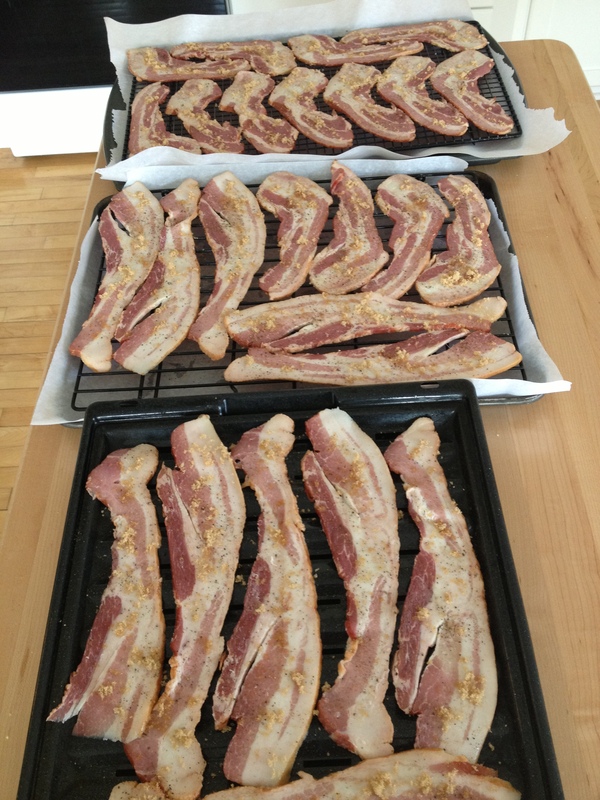 Arrange bacon in a single layer on the two racks. 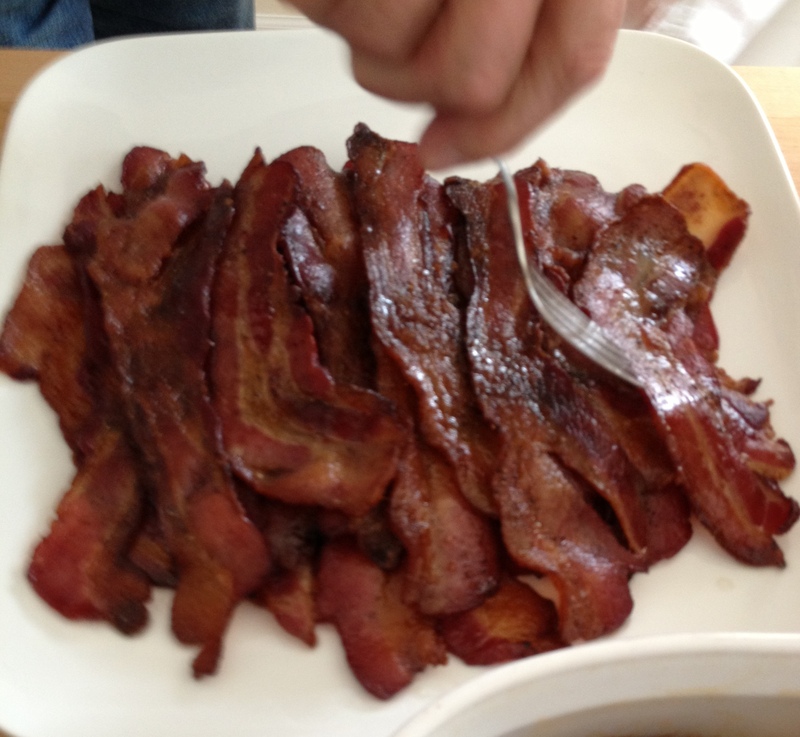 Evenly sprinkle with pepper and sugar.Bake until bacon is crisp and browned, rotating sheets halfway through, 30 to 35 minutes. Pat dry with paper towels. KJ, the bacon reminds me of an appetizer G’ma used to make. She’d wrap a slice bacon around a club cracker then maple glaze them in the oven. So yummy! I remember those! They were delicious!! !